Apparently Virgin and William thought it would be “fun” to introduce me to a new writer. I devoured AM Homes’ novel This Book Will Save Your Life . I loved it for it’s uncomfortableness, disliked that she didn’t understand the geography of Los Angeles, liked that she understood the flavor of our city. I immediately downloaded another of her books, Music for Torching . I sat down on a Saturday morning, got to page 75 and declared it a wonderful read (because it is). I then proceeded to tell friends and acquaintances that I was reading the most wonderful book about suburbia. And then I got to page 77 and the lesbian affair. The graphic lesbian affair that would let you know exactly how things are done. This is tame compared to some of the other pages and I’ve just recommended this book to women I know only through children’s sports. I’m pretty sure I never want to see any of them again… it was super porny. I’ve ruined the gas grill. I often pride myself on completing difficult tasks, but this might be the most difficult yet. I set it on fire. Not the outside of the grill but the insides of the grill, there was fire and it just sort of disintegrated shortly after the flames were a meter high. When I started reading Music for Torching they (the husband and wife) use the grill to set their house on fire and presumably start anew. I found it wildly disturbing and not at all relatable, the only thing we have in common is that we can’t be trusted with a grill. I picked up some beautiful porterhouse steaks from Whole Foods and was drying them in the refrigerator. 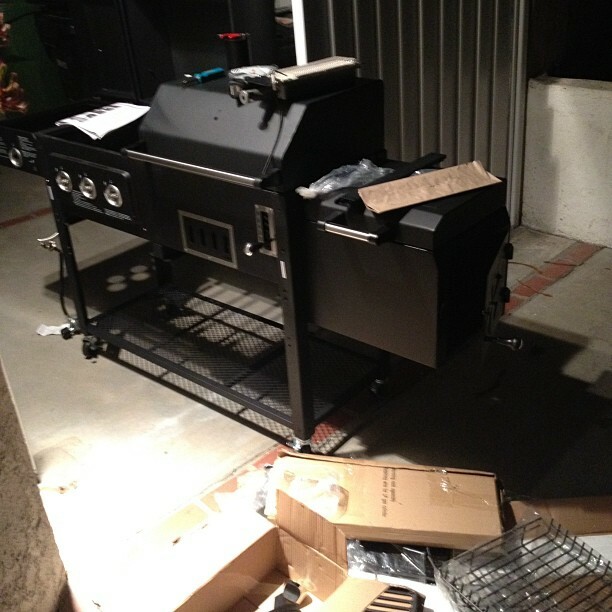 They were absolutely perfect and last night I remembered that the grill was just a cadaver and needed replacing. Since I’m halfway through a road test for the Kia Rio and neither Mr G nor I have cars with flip down seats I decided to run to OSH and pick up a grill. Of course I got to talking with the guys in the grill section and they were like, “This one is a gas grill, charcoal grill and smoker.” I asked them what a smoker is and they got all excited and twenty minutes later I was pulling the Kia up to the back for them to load up the grill. Junior and I were convinced it would fit. We made believers of them. Of course unpacking it was another story all together. It was nearly impossible to remove from the car so I just slit the sides of the box with a razorblade and took the components out piece by piece. I listened to Howard Stern for three hours and at 11pm I had this. Sometimes I wish I could put together an outdoor item a day. It’s just fun, like LEGOs but for grown ups. I went to bed tired but happy. Content really, it had been a pleasing day. This morning the window washer arrived. He was a little late with a new helper so I wasn’t optimistic and then something amazing happened. He explained to me that his new helper was an ex roofer and was really good at walking on roof tiles, he could clean my skylights. I shouldn’t be this excited about clean skylights. No one should but I am. I’m actually overjoyed and I keep standing on my landing looking up to the blue sky and wondering how I ever got so lucky. I’m a simple woman. Wash my windows, bring me joy. Who needs 50 Shades of Grey when you have A.M. Homes and lesbians, right?